The tremors came unexpectedly, like a thief in the middle of the night. At exactly eleven minutes past midnight on August 17, 1976, a massive earthquake with the magnitude varying between 7.9 and 8.2 on the Richter scale jolted those in the areas surrounding Moro Gulf in Mindanao. The sudden movements of the earth proved to be destructive in Cotabato, where 1,500 people perished after several buildings were reduced into pathetic rubble. 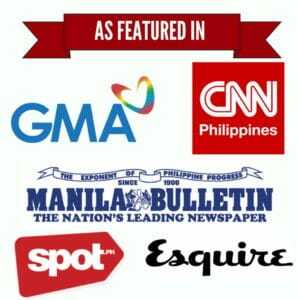 In Pagadian, a coastal city 80 miles northwest of Cotabato, the quake was enough to wake people from a deep sleep and make them realize that something unusual was about to unfold. But only a few heeded the warning, like the housewife who woke her 10 children up and hastily evacuated to higher grounds. For the majority, however, the lure of staying asleep was too much, and it was something that ultimately cost them their lives. The epicenter of the great earthquake was located 40 km off the shores of Sultan Kudarat. From the depths of the Moro Gulf came giant waves that moved in all directions, slowing down as it reached the surface to form one of the most terrifying phenomena known to mankind—tsunami. Signs of the impending cataclysm happened so quick, giving those in the coastline little or no time to prepare. Within few minutes after the earthquake, water started receding as far as 2 km, exposing plenty of fish flapping for their lives and parts of the islands never seen before by the locals. And then came the deep terrifying sounds that closely resemble a “cascading rain,” “boiling water,” or the “rumbling of many trucks.” Little did they know, the unusual sounds were nature’s last plea to people who should have started running for their lives. But it was too late. Three to four waves towering to as high as 9 meters came crashing down to the 700-km coastline surrounding Moro Gulf. 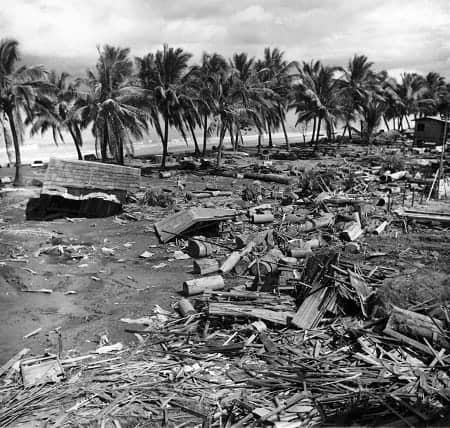 Coconut trees were uprooted, fishing boats sunk, fishponds destroyed, cars smashed onto each other, and countless buildings reduced into pieces of wood and steel. Nonetheless, the staggering number of properties destroyed was not even enough to equal the human lives lost in the tragedy. 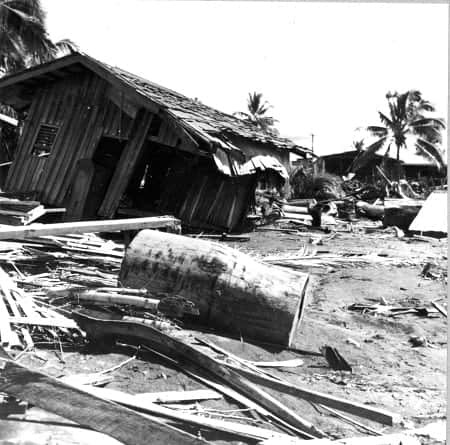 Tsunami damage at Barangay Tibpuan, Lebak, Mindanao. Published on back cover of U.S. Geological Survey. Earthquake Information Bulletin. v. 14. no. 4. July-August 1982. Those were the first few words uttered by then social welfare minister Estefania Aldaba-Lim upon her arrival on the morning of August 17 in Pagadian City, where the strongest blow of the tsunami was felt. The area was literally wiped out by thick layers of mud, with house debris along with thousands of dead bloated bodies floating everywhere. 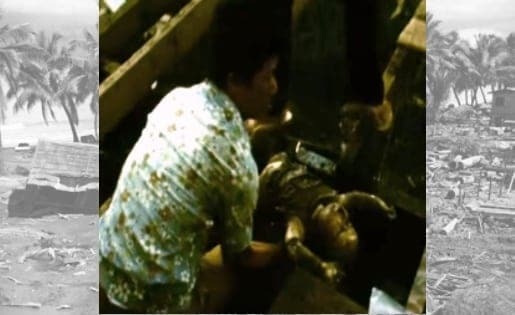 The retrieval operations were nothing short of emotionally taxing: “Mothers with babies tightly clasped to their breasts, fathers holding on to the little children… Nakakaawa talaga,” recalled Aldaba-Lim, who sustained severe sunburns as she led the mass burial of the victims. When the official casualty count was released, the extent of the strongest and deadliest earthquake to ever hit the Philippines became apparent. Over 8,000 people were either dead or missing (most likely dead), 10,000 were injured, and about 90,000 were left homeless. Among the hardest hit areas were the coastal villages of Sulu, North Cotabato, Maguindanao, Zamboanga provinces, Lanao del Sur and Lanao del Norte. The tragedy exposed the country’s lack of awareness, let alone preparedness, for a disaster as unpredictable and swift as a tsunami. About 95% of the casualties were victims of the tidal waves, which didn’t make sense at first since most seashore dwellers were trained swimmers. But even the most skillful would have a hard time swimming through sea water that combined with slum sediments to form mud, a lethal combination that choked many victims—mostly women and children—to death. Following President Ferdinand Marcos’ declaration of a state of national calamity, local resources were mobilized to help in the relief operations. It can be recalled that the strongman refused foreign aid, including that of the US which was still engaged in several negotiations with the Marcos government at that time over the issue of American bases in the Philippines. Moro Gulf, Philippines, Earthquake August, 1976. Tsunami damage at Lebak, Mindanao, caused by the magnitude 7.8 earthquake. Back cover, Earthquake Information Bulletin, v.9, no.6. The great earthquake and tsunami of 1976 also prompted Marcos to revise the provision of the National Building Code a year later. The said code stipulates that structures built must be resilient to an Intensity 8 earthquake. It was also in the late 1970s when he created the forerunner of today’s National Disaster Risk Reduction and Management Council which is tasked to ensure the protection of the Filipino people in times of disasters. The local government also conducts a series of earthquake and tsunami drills especially during the National Disaster Consciousness month, in hopes that the public will be better prepared once a catastrophe as intense as what happened in 1976 strikes again. Based on the history of tidal waves in the Philippines, it seems that they have every reason to prepare. Before 1976, a total of nine tidal waves had been formed in the Moro Gulf, which roughly translates to one tsunami every nine years. Statistics also show that the area surrounding the Moro Gulf is the most prone to tidal waves. But if Philippine Institute of Volcanology and Seismology (Phivolcs) director Renato Solidum is to be asked, it’s not only Mindanao but the whole archipelago that is at risk of being crushed by the mighty waves of a tsunami. Located along the Pacific Ocean’s Ring of Fire, the Philippines is literally surrounded by different trenches that could unleash powerful waves once an earthquake forms. And unlike other countries like Indonesia and Japan, these trenches were closer to Philippine shorelines, making our country vulnerable to deadly tsunamis that could strike within 2 to 5 minutes, just like what happened in 1976. History repeats itself, and in the case of the 1976 Moro Gulf tragedy, only God knows how long will it take before a Philippine trench unleashes the “Big One” again. But there’s still time to prepare, and for the Philippine government and communities to proactively avoid the dangers that lie ahead.